Happy New Year! Free Remix and New Video! We hope you had a fantastic 2010 and we hope your 2011 will be even better! To celebrate the new year we are hereby giving you a new free remix of Raincoats made by Kasper Winding and also a video featuring the (almost) original version of Raincoats and footage from the Danish web series Robin Färdig by Danish director Daniel Kragh-Jacobsen. Download Raincoats (Kasper Winding Remix) here. We suggest that you add this remix to the playlist for your party tonight! The entire Robin Färdig web series can be watched at dr.dk/pirattv. Raincoats is the theme song for the series and the Raincoats video gives you a glimpse of the Robin Färdig world. Currently there is no international version of the series but if you understand Danish we recommend the series – it is fun and brings back memories of the troubled times in high school. Before we say goodbye we want to give you these four recommendations of some of our favorite albums released in 2010. Have lots of FUN tonight and take care of each other and the rockets. The year is coming to an end so as usual we all look back and try to remember all the great things that happened. Especially music medias like to indulge in this kind of thing and right now they are all doing their year end lists – and we are of course happy see our Magic Chairs album pop up in a good bunch of these lists. We promise to do a bigger post about 2010 later on! Stay tuned. In the meanwhile feel free to tell us about your favorite albums released this year. Today we can reveal the 2nd teaser for AN ISLAND, the film we are working on with French director Vincent Moon. The film will have the same length as an album and in it you can see us in several musical experiments and collaborations with more than 200 kids, parents and local musicians on a very special island in the Danish country side. Today we can also announce the first 23 official screenings of the film. We will take the film with us on tour in February and March and before all the concerts (except in NL and DK) we will be screening An Island. The teasers can both be watched at the website for the film WWW.ANISLAND.CC and also at our Vimeo account. More teasers will come soon and it should also be mentioned that we have very exciting and democratic plans for how An Island will premiere in early February. We will be needing your kind assistance so stay tuned please! Efterklang will play live in Copenhagen in Amager Bio on March 18th, but we will not be screening the film this day. Together with Filmmagasinet Ekko we will present Peter Broderick live and a screening of An Island in Amager Bio on Sunday March 20th instead. It will be an seated afternoon concert and screening and it will only cost 30 kroner to get in and enjoy Peter’s incredible live performance and to watch An Island on Amager Bio’s huge screen. Tickets will not be sold in advance, but at the door, and also at Efterklang’s concert on March 18th. However you should note that advance tickets for Efterklang’s concert in Amager Bio on March 18th are available from http://www.billetlugen.dk/musik/14075/, and the first 150 tickets to be sold will give entrance to both events (March 18 and March 20) in Amager Bio. Final Concerts in Copenhagen and Brussels! We have just announced two more dates for our final Magic Chairs Tour in February and March. March 1st we will play in Brussels at Botanique and then we will end the tour with a big homecoming concert in Copenhagen on March 18th at Amager Bio. Our last Magic Chairs Tour holds 27 concerts and once it is over we will take a long break from touring. In fact we plan not to play a single concert before we have finished our 4th album sometime in the far future. With this tour we will finish almost 3,5 years of non stop touring and it has been an adventure. An incredible adventure. Please visit EFTERKLANG.NET/HOME/CONCERTS for all upcoming concert dates! Shows in Belgium, Turkey, Russia, Sweden, Netherlands, UK, France, Switzerland, Austria, Slovakia, Czech Rep., Germany & Denmark coming up! Thanks to the Belgium Efterkids! You were so good! We will never forget the concert we played with you yesterday! Keep playing music and being so cool and happy! And thanks to your teacher Yumika as well! PLEASE WATCH THIS TV REPORT BY TV BRUSSELS! Magnifique!!! 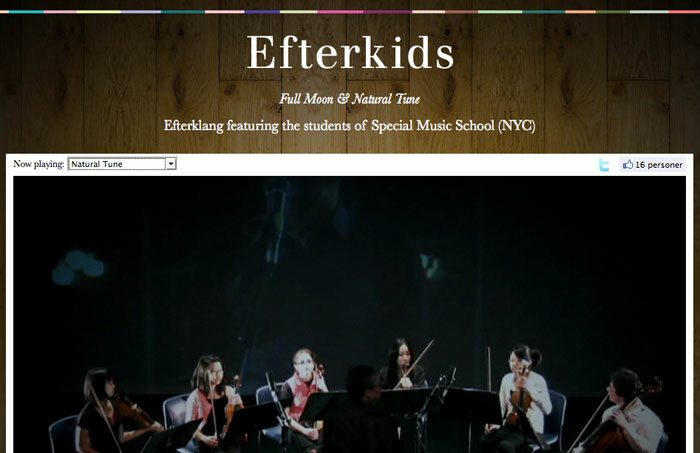 This week we play three concerts in Belgium (and one in Istanbul) and for the concert in Brussels we are happy to announce that we will be joined by 6 local Efterkids! For the concert at AB (Ancience Belgique) on Wednesday Yumika Lecluyze who teaches at the music school of Sint Agatha Berchem will bring 6 of her students who has been rehearsing on the string parts for Natural Tune and Full Moon the last couple of weeks. We look forward to meet the kids and play music with them. We don’t know their names yet, but we know that they are 8,10 and 11 years old and that Yumika teaches them after the Suzuki Method. Three months ago in August we met up with our friend and French filmmaker Vincent Moon on an island in the Danish country side. The objective was to shoot a film. A film with the same length as an album and a film full of performances, experiments and collaborations. We were there with our 8-piece live band featuring Niklas Antonson (Slaraffenland), Heather Broderick, Peter Broderick and Frederik Teige. 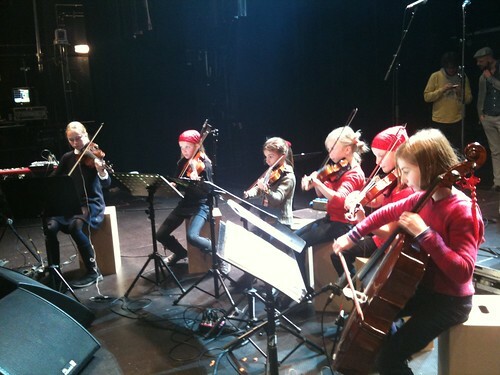 Over an intense period of 4 days we managed to collaborate with more than 200 local musicians, kids and parents. Today we are able to present the very first teaser of this film and we can also let you know that the film will premiere in February 2011. We value An Island as much as we value our albums. We consider it one of the finest projects we have ever been involved in and can’t wait to share it with you. Tomorrow we start a new tour in Europe and to kick this off and same time honor the previous tour in North America a month back we want to share this video with you. It is sort of a “best of” or a summary of our CHORDS project. When we toured North America in September and October 2010 we filmed a CHORD everyday and posted it to our photo blog on Flickr. The video we want you to watch now today contains snippets of each chord. The project worked as an alternative tour diary and was developed on the go. It features guest stars, singing water taps, audiences, random strangers, helicopters, Harley’s and lots more. You can watch the entire collection of CHORDS here! AND HERE IS THE VIDEO – ENJOY! Frederik Teige our live guitarist has just released a new single and beautiful video! The song is called Elevate and it features many sweet guest musicians including Thomas from Efterklang and Niklas from Slaraffenland/Efterklang. Final Magic Chairs Tour Announced! As you might know we will be on the road in November in Denmark, Liverpool, Belgium, Istanbul, Spain, Lisbon, Russia & Uppsala. 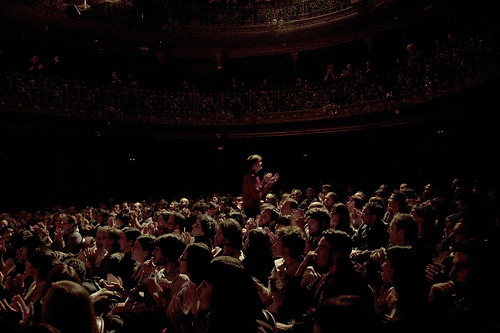 But we also just announced a full European tour in February and March 2011. This will be the absolute last chance to see Efterklang perform live for a considerable amount of time. After this tour we will take a break and when we get back together we will begin the work for our 4th album and we have decided that there won’t be any Efterklang concerts before this album is finished. The tour in 2011 will be special as it is the last, but also because of the first 4 shows that will be very special and then we have a very special support act/event lined up for the rest of the tour. We look forward to announce this soon. Once this last tour is over we will have played more than 340 concerts since October 2007. It feels like we have been on tour almost constantly. We have loved every second of it and would just like to say thanks for the ride! And here is a new Efterklang photo!